What is MyBaliTrips.com affiliate program about? The purpose of MyBaliTrips.com affiliate program is to give the owners of information resources about Bali the opportunity to offer their visitors tourist products of high quality and get a good reward in return. For example, if you have a blog about Bali or a group in Facebook or a popular channel about Bali on YouTube you can add an affiliate link to MyBaliTrips.com on your resource and get paid for every successful purchase made by your visitors. It is very similar to flights and hotels affiliate programs you perhaps already work with. How does the affiliate program work. You refer the visitors of your website to mybalitrips.com through special affiliate links and get rewarded for all the services purchased by the tourist. How to start making money. Learn about the tourist products and promo materials. Add affiliate links and banners to your websites, blogs, social networks. Watch the statistics of redirected visits and orders. Optimize your articles and promo-links posting for maximum conversion. Indicate your payment details to get paid. Get a reward in the next payment period. Learn more about payments. What orders are subject to partner reward? A reward is added for paid and completed orders. For example, if a client has booked a trip but later has cancelled it (got sick, etc.) the reward for such order can not be paid. We accept any traffic but a branded traffic to our site in the systems of contextual advertising. In other words it is not permitted to place contextual advertising (in Google and Yandex) that takes directly to mybalitrips.com domain. Illegal traffic is also forbidden: spam, any unauthorized bulk mailing, web-spam etc. We reserve the right to unilaterally block the partner’s account for such acts and withhold any payments to him. The important issue is you should not in your articles promise more than it is indicated on the landing page of the product on mybalitrips.com. For example, if landing is saying that the tour is a group tour, you can’t promise your visitors an individual tour. It leads to failed expectations and negativity from the client’s side. Can I book your services for myself through an affiliate link? Yes, you can make orders through your affiliate link for yourself or your friends. In fact, that would be a good test for our affiliate program functioning. How do affiliate links and cookies work? After the user clicks the affiliate link with your identifier (like https://mybalitrips.com/ru/trips/?utm_pid=), his browser will store cookies for 90 days. If during this period he makes an order on mybalitrips.com, you will get the partner’s reward equal to the commission fee for tickets purchased by the client. The amount of remuneration is indicated in the partner’s profile. You will also get paid for all the subsequent orders made by the client. For example, you have posted an article about the Gili Islands on your blog and placed an affiliate link to mybalitrips.com as a recommended site to buy the tickets to Gili. The user clicked on the link and made a purchase. After a while he came back to mybalitrips.com website himself and bought an ATV tour and a general tour around the island. You will be paid for 3 tours purchased by the client. Furthermore as per our experience most of the clients go on a tour in a company of a friend or friends. If the client from our example will take a friend to all 3 tours, you will get a reward for 6 sold tickets. You can refer your visitors to any pages of mybalitrips.com, just make sure your partner identifier is indicated. Affiliate links are the easiest and fastest way to start earning. Just place the link along with recommended text on your resource. Your affiliate link will look like https://mybalitrips.com/ru/?utm_pid= ?? instead of "??" will be your affiliate number. In your account, in the section "Products and Promo", you can obtain your affiliate link to each specific product. We provide banners for our top products and general banners of MyBaliTrips. The banner is great for site header, blog's sidebar or posting at the beginning of an article/page. Your affiliate link is already embedded in the banner code. In our experience and analytics from partners, buttons have the best conversion rate amongst other tools. Buttons are better to use if you have pages with listing trips or products, so you can put the call-to-action button under each item. When placing the buttons, try to add a recommended text. Buttons can be customized by background color, font color, and size. The most effective sales tool. A widget is an embeddable block that shows current product information. You can create widgets yourself with the products you need, or use our ready to go selections. Your affiliate link is already embedded in the code for each widget. In order to add the widget on your web, you need to insert the widget code to the pages of your site. We recommend using widgets in large content articles about Bali. Let’s say that a visitor of your website was referred from an interesting article about Ijen volcano to mybalitrips.com and he bought a tour to Ijen. The fee for this ticket equals $10. In most cases people travel with friends, so you will get paid for their trip at least $20. Let’s say that after a while they bought the tickets to the Gili islands (the fee is 2x$4) and a rafting tour (the fee is 2x$7.5). All that will be added to your reward. Therefore you will get $43 for 2 friends. Your profit will depend on how many targeted visitors you will refer from your site to mybalitrips.com. Keep developing your website and gain money! When I will receive my reward? The reward is payable to the partners between the 10th and 15th of the next month. For example, if you had a paid order on June, 20th, you will get a reward for it between 10th and 15th of July. Such a delay is caused by the terms of payments with suppliers that are carried out in the beginning of the next month based on the results of the previous month. The reward will be made automatically if you have indicated the payment details in your profile and you earned more than $30 for the previous month. If the amount of your reward is less than $30, it will be forwarded for payment to the next month. Where do you transfer a partner reward? Is there any limits? Please indicate a payment option in the partner’s profile. The minimum payment amount is $30. If the amount of your reward is less than $30, it will be forwarded for payment to the next month. Why there are no rewards for some tickets? Yes, for some tickets we set a minimum price and a zero partner’s reward. It is done to make them attractive for the client. This kind of services is easy to advertise. For example airport transfer service. 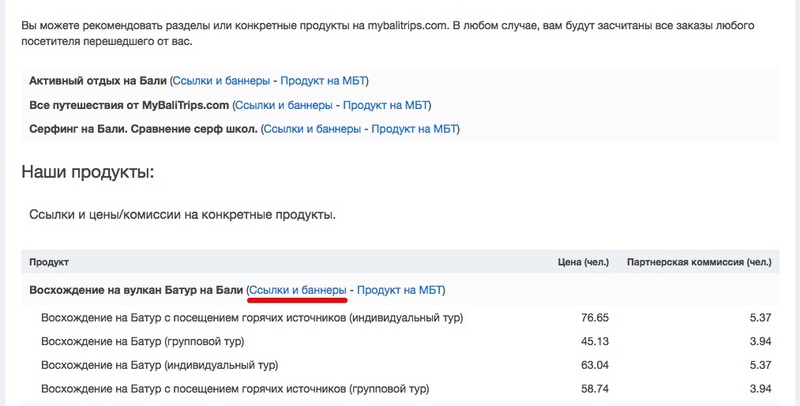 That’s how it works: you motivate the client to order an airport transfer on mybalitrips.com. The clients make orders because the service has the best money/value ratio. The client gets acquainted with our company and our good quality service. As a result very likely he will keep buying tourist services on mybalitrips.com, for which you will get a reward already. Why the amount of money I got is less than indicated in my profile under the balance section? The payments made include the commission fees for the orders completed (the trip has been successfully made) in the previous month. For example if the trip was taken July, 5th the reward for the order will be actually transferred to you in August. Although the amount indicated under the balance will include the fee right after the trip was made. What are UTM codes and how to use them? UTM codes help to segment your traffic and identify what sources work and sell better. utm_pid – a partner’s identifier. It shows who will get a reward. It is mandatory to use it. utm_source – is usually used to track the source of traffic. For example: vkontakte. It is used optionally for the analytics purposes. utm_campaign – is used to specify the traffic source. For example: banner1. It is used optionally for the analytics purposes. utm_content - is used to specify the traffic source. For example: article1. It is used optionally for the analytics purposes. For example, you are a partner with an identifier 100. You have a blog and a group in Vkontakte and you would like to track what source brings you more sales, then in your blog you need to use the following tracking url: mybalitrips.com/?utm_pid=100&utm_source=my-site&utm_campaign=mainpage And in a group in Vkontakte use the url like mybalitrips.com/?utm_pid=100&utm_source=my-vk-group. Then in your partner’s profile report you can filter by "my-site" or "my-vk-group" and learn the visitors of which source bring you more sales. How often the clicks and orders statistics is updated? All statistics is updated in real time. For example, you will see a new order in a partner’s profile right after the client has made it. Why is it important to use and analyse UTM tags in an affiliate link?